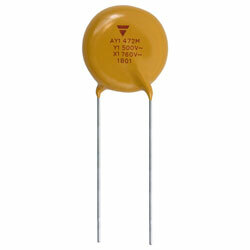 RS Components now stocks a new range of automotive-grade AC-line-rated ceramic disc capacitors, manufactured by Vishay. The high-reliability radial-mounting AY1 series is qualified to AEC-Q200, satisfying the stringent demands for use in automotive. The series has been tested to withstand the rigours of the 85/85/1000h test (85C /85% relative humidity for 1000 hours), as well as passing 1000 temperature cycles from –55C to +125C. Also, the series also passes the high-voltage 10kV pulse test (10 per polarity). The devices also meet IEC60384-14.4, which gives specifications for fixed capacitors for EMI and RFI generation and suppression, as well as for mains supply connection. The series is, therefore, ideally suited for deployment as Class Y1 safety capacitors in industrial and automotive environments, for example in AC-line filtering and primary-secondary coupling on battery chargers for various types of electric vehicles including HEV/PHEVs (hybrid/plug-in hybrid electric vehicles), or as filter capacitors on DC/DC converters in PHEVs. Key electrical characteristics comprise a capacitance range from 470 up to 4700pF with a tolerance of 20% and voltage ratings up to Class X1 (760 VAC)/Y1 (500VAC) and 1500VDC. The capacitor’s ceramic disc is copper plated on both sides, and features tin-plated copper-clad-steel connection leads with diameters of 0.6mm or 0.8mm. Available with straight leads with spacings of 10.0 or 12.5 mm, the devices are encapsulated in flame-retardant epoxy resin, in accordance with UL94V0.